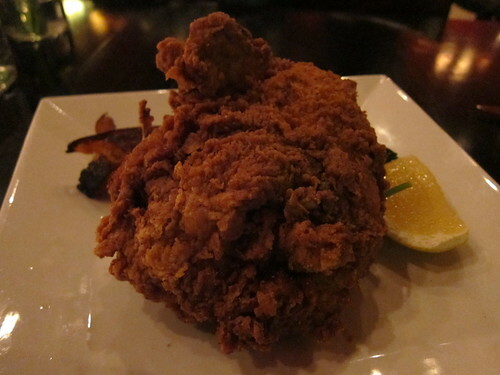 If “November” and “turkey” have become a little too synonymous for you, you’re lucky to have the option of some good ol’ fried chicken at Cube. It’s available only until Wednesday, November 24 – and if you don’t catch it now, you can expect to see it again in about a year. The recipe is of the Tuscan variety and for $23 you get a a half-chicken chock with lemon wedge, Maple Roasted windrose Farm White Acorn Squash and sauteed McGrath Pea Tendrils. This isn’t your usual, butter-filled entree but rather a zesty, juicy bird that packs a punch; red pepper flakes are in the batter. The fluffy breading crumbles beautifully under the weight of your knife (should you feel like sharing) and between your jowls to reveal an extremely tender, semi-boneless masterpiece by Executive Chef Erin Eastland. 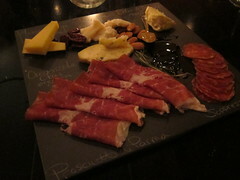 While you’re at Cube, don’t forget a custom cheese-salumi plate of your choosing and glass of wine to start. It’s always a delightful experience whenever I’ve dined there; tryingÂ the limited edition fried chicken plate was no exception. To finish it off, go seasonal andÂ try their Warm Hachiya Persimmon Pudding or satisfy your chocolate craving with Dark Chocolate Espresso Cheesecake. This entry was posted in Dessert, Food, Mid-City West, wine and tagged American, autumn, cheese, chicken, Cube, Cube LA, dessert, fall, fried chicken, Italian, la brea, Marketplace & Cafe, pasta, persimmon, Tuscan fried chicken, wine, wine bar. Bookmark the permalink.